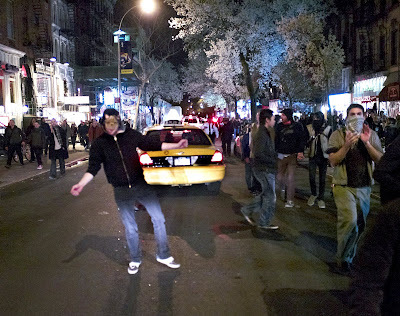 Perhaps those that organized "CATastrophe" had intended just an anarchic , roving , rebellious evening of music and dancing in New York City streets . 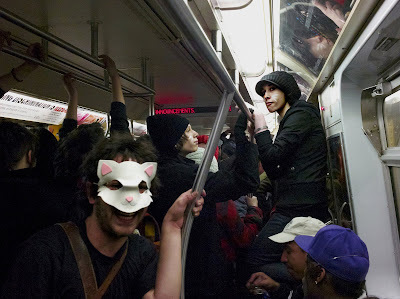 CATastrophe seems to have been intended to be a rave in the streets with the music broadcast to the cat costumed and masked partier's "boomboxes " by a small transmitter operated by CATastrophe organizers . 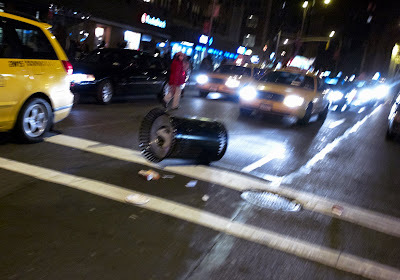 What CATastrophe proved in the end to be was a quite different event . 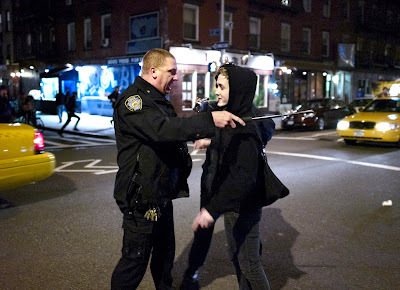 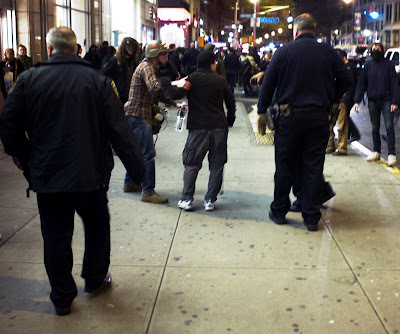 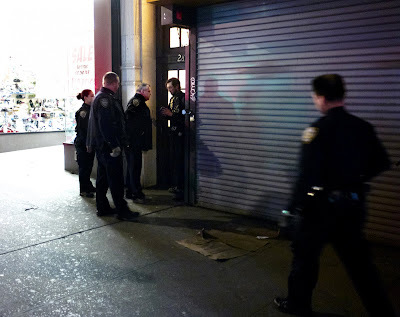 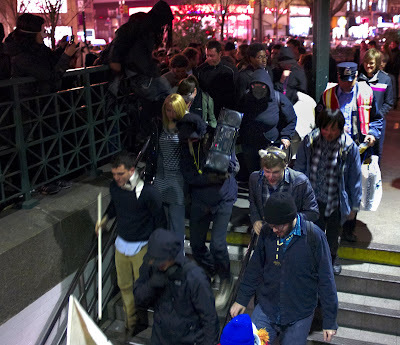 CATastrophe which began in Union Square Park at 9 PM Saturday night , unlike previous similar events had an unexpected police presence from the very beginning . 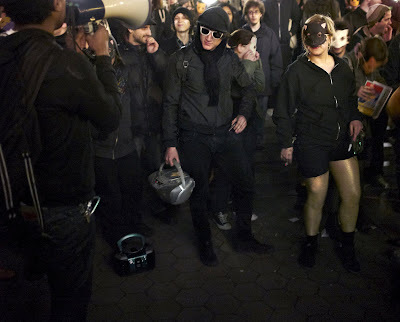 Similar previous events , for instance last year's "Pandamonium" which began in Union Square and ended with a dance party on a Brooklyn street , also were attended by police but not from the very beginning . 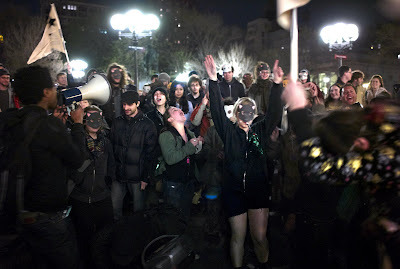 As the group moved from U.S.P. 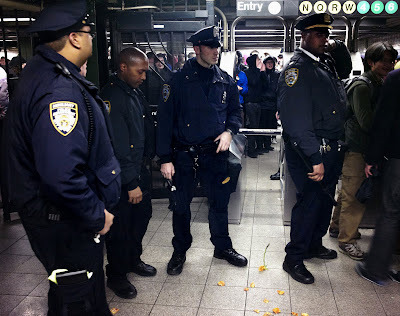 to the L train below police were waiting below to meet them at the turn styles . 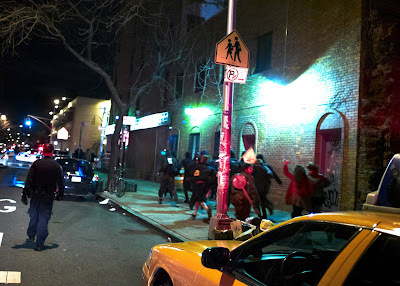 Of course some attempted to jump the turn styles and of course the police stopped them from doing so . 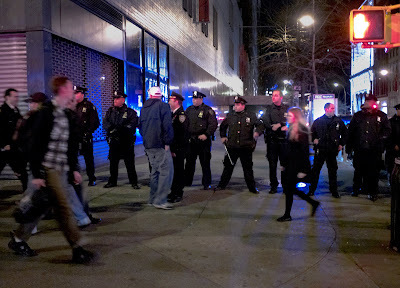 We do not know if there were any arrests at this point . 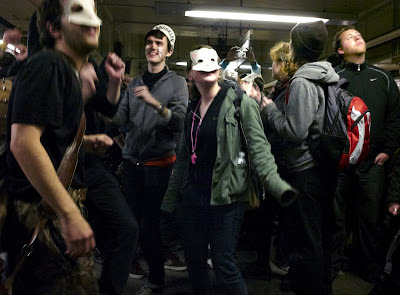 On the subway platform below folks sang and danced while waiting for the L train . 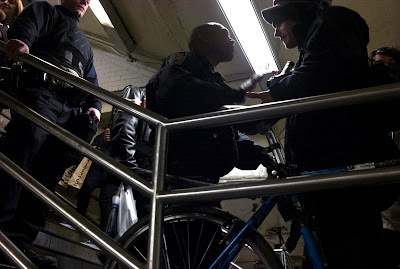 The police watched . 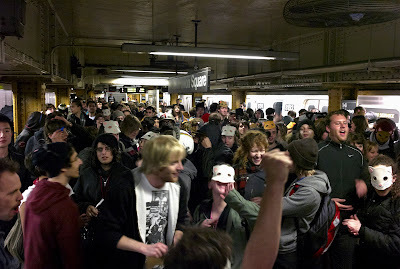 When a train did come it filled quickly and folks partied their way by train to the next stop , first avenue , where they left the train . 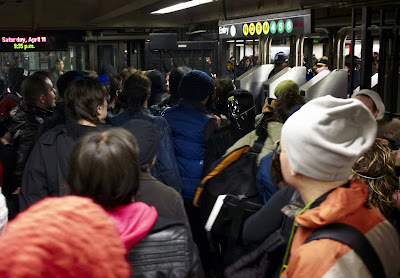 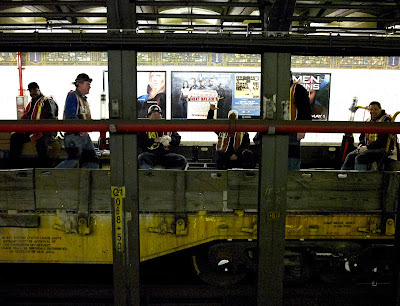 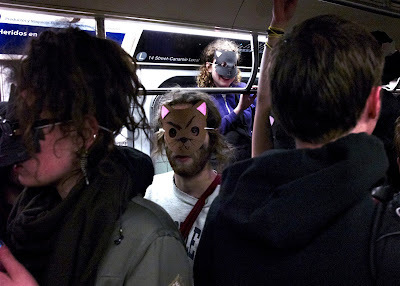 Across the tracks an entertained track repair crew watched the group of 150 or so masked and hooded members of CATastrophe party on the first avenue subway platform . 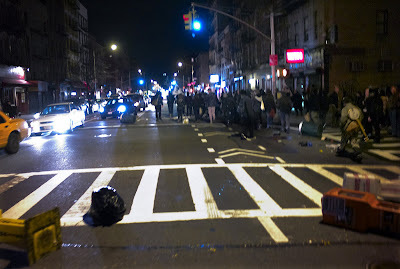 After reaching the street the group headed east on 14th street to avenue A . 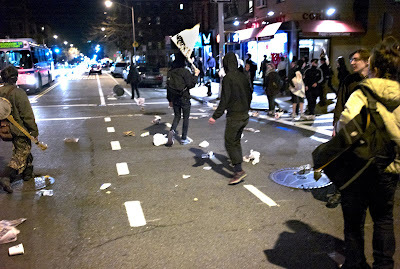 As the group rounded the corner to head down avenue A , they began dumping the garbage cans and newspaper dispensers in the street . 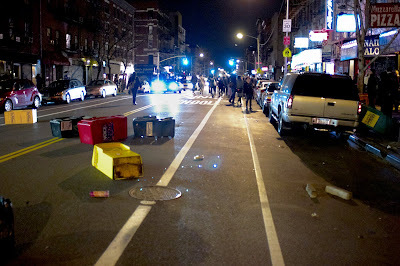 This behavior at the corner of avenue A and 14th street seemed to set the tone for the evening's remaining activities . 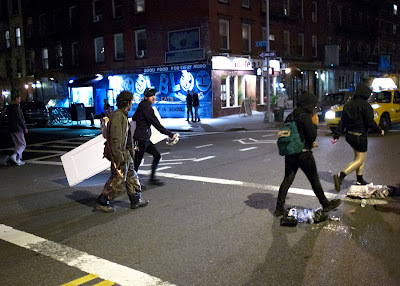 The CATastrophe party seemed here to have been taken over by several individuals in dark colored hoodies with bandannas obscuring their faces that reveled in raising hell throwing things in the street in front of cars and also , we were told , breaking a few windows along the way . 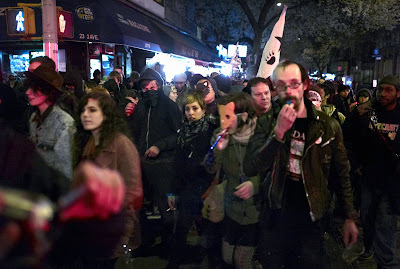 The group , now more protestors in sympathy with the spirit of the more violent side of this weekend's East Village hosted "Anarchy Fest" , headed down avenue A to 11th street , to second avenue , to St.Marks place , to Broadway , to 14th street and Union Square Park , then on westward on 14th to a spot just beyond 5th avenue . 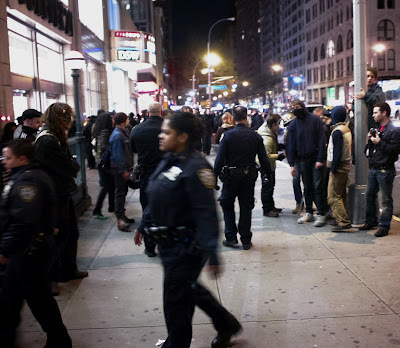 Police made sure that no one was going to get anywhere near the 5th avenue entrance of the New School where for two days there were continuing problems with protests . 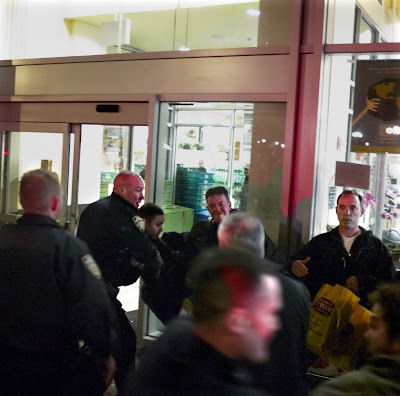 While passing Whole Foods on 14th street it seemed that one protester attempted to break a window , we heard a loud clunk , but the Whole Food window did not break . 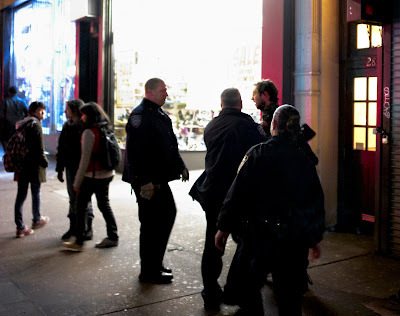 The protester was arrested immediately . 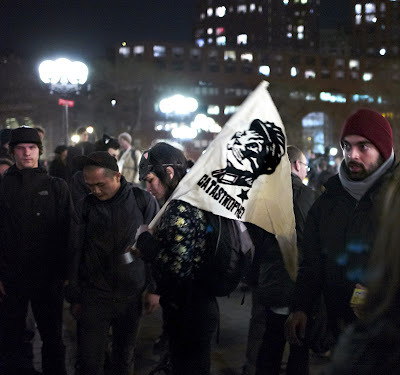 The party-turned-protest more or less ended around 11PM with a few remaining participants returning to Union Square Park .